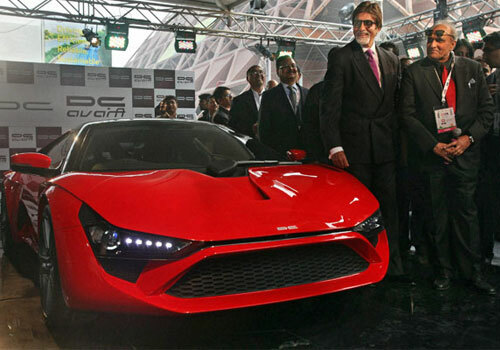 Indian supercar DC Avanti that was unveiled by ‘Bollywood ka Shahenshah’ Amitabh Bachchan at the recently concluded Auto Expo 2012 is just an year away from commercial production. As per the latest update on the Indian supercar, the DC Avanti will be up for delivery in India in 2013. The Rs 25-30 lakh (expected price) car is indigenously made and outputs 240bhp that will take the car to a 100 kmph figure in just 3.7 seconds. The DC Avanti is the only car that can be called as truly Indian sports car. However, it sports a foreign heart. The DC Avanti is expected to sport a Ford Ecosport sources 240 bhp petrol turbo engine. There will also be a V6 Honda engine based car that is expected to have 400 bhp power which is mighty enough for a sports car like this matching it with Ferrari California that has a V8 engine outputting 458bhp. If we talk of the looks, the DC Avanti has all that an adrenaline pumping machine should have. Aerodynamic body with mesmerizing exterior features with daytime running lights besides other features make it a true sports car. And, at a price much less than a Ferrari that starts at Rs 2.2 crore. The two seater twin door car weighs 1560 kg and will have anti-lock braking system besides SRS air bags and a wide array of safety features that are the essentials of a sports car like this. Besides all other features and contrary to Ferrari cars, the DC Avanti will not be needing special flat roads to run, thanks to the 155mm ground clearance. There will be a six speed automatic gearbox transmitting the 240bhp power to the wheels in toto. The engine in the DC Avanti is able to output such mammoth power following the VVT and direct injection technique used in it.